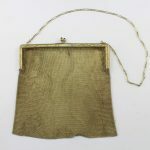 This 14 karat yellow gold purse is really stunning. It is from the 1920’s flapper era and has all the extravagance of the era. The “Roaring 20’s” were a time of innovation and good fortune. It represents the care free mood of the era. This purse has beautiful engraved details on the frame and the clasps feature blue stones that we believe to be sapphires but cannot say assuredly. The purse has a small mark on the inside of the frame. 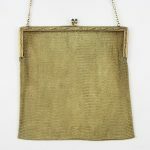 The natural aged patina has been left on this antique purse. 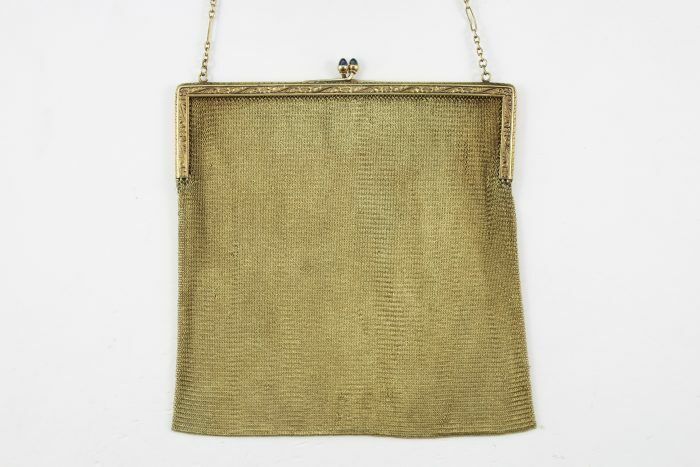 This pocketbook is truly a part of history. Please be aware that sizes and colors can be slightly different than they may appear in the photograph based on the camera and differences from computer to computer. We try to make colors as true to the piece as possible and offer comparison photographs (as well as the actual measurements) to eliminate as much confusion as possible.